FRANCIS | COURAGE FOR AMERICA! Any person with a modicum of intelligence and humanity in them would detest all three answers– and denounce the person who would make such statements. Now, do you think that the press is up in arms about this? Not at all. Francis’s horrendous statement is being brushed aside by the mainstream media, as well as by the opportunistic modernist Catholic media, which will justify anything to advance its material interests. Rightly so, the aforementioned media does not tolerate the same statement when applied to Nazism or Apartheid. So why does it tolerate it when it comes to Marxism? The magnitude of Francis’s offensive statement cannot be measured. Over 120 million human beings have been exterminated under Marxist regimes– not including those who have been murdered through forced abortions, as part of socialist depopulation policies. The death toll continues in Cuba, China, North Korea, Laos and Vietnam– as well as in other satellite socialist countries in Africa and Asia. The Communist madman who is least afraid to reveal his executions and human rights abuses appears to be North Korea’s Kim Jong Un– who recently executed his uncle. Marxism can be credited with deadly gulags, deadly labor camps, and fatal exoduses– as in the hundreds of thousands of Cubans who have drowned or been executed while escaping Communist Cuba. The bloody trail of extrajudicial trials, which are always preceded by torture and followed by executions, continues to this day under Communist regimes. Man-made famines, as in the Ukraine under Stalin, as in Zimbabwe under Mugabe, as in Somalia under the Siad Barre dictatorship, as in Cambodia under Pol Pot, are responsible for millions of deaths in the Marxist massacre. Should I go on? Francis, the leader of the Roman Catholic Church has shamelessly stated that he is not offended if someone calls him a Marxist; as such, Francis has trivialized and dehumanized the most massive genocide recorded in human history. As a survivor of Communism under Castro’s brutal dictatorship, I am asking that you watch the following short video, in memory of the millions who have been imprisoned, tortured and executed as a result of Marxism, including members of my family. Join Marielena Montesino de Stuart’s special list of readers. SOMEONE HAS TO SAY THE TRUTH… PLEASE SHARE IT! Catholic Church, China, Città del Vaticano, Cuba, Francis, Kim Jong Un, Laos, Marielena Montesino de Stuart, Marielena Speaks, Marielena Stuart, Marxism, Marxist, North Korea, Pope, Somalia, The Vatican, THE VATICAN: Francis trivializes and dehumanizes the most massive genocide in human history, Ukraine,Vietnam, Zimbabwe. The presence of the New World Order leaders in Johannesburg has everything to do with power, greed and control– and nothing to do with the well-being of the black population of South Africa. The long-suffering people of Africa have experienced nothing but lies and abuse at the hands of socialists. Racial equality, which is granted to every human being from the moment of conception through the Natural Law of God, has been manipulated as a political “cause” in Africa– by the European Socialists of the United Nations—through Sustainable Development (Agenda 21) programs [*- see footnote] NGO’s and indoctrination curricula. Instead of turning to God—and using the Natural Law as the basis for public policies, generations of Africans have been told that they need to turn instead to socialism. Yet, in the face of South Africa’s grim social and economic state, New World Order leaders have descended en masse on Johannesburg, in an obvious show of force after Mandela’s death—ignoring the everyday painful reality of the South African black population. During my campaign for the United States Senate (FL-Republican, on the ballot, 2012) I warned that American citizens needed to brace themselves as the world rapidly descends into a socialist abyss. As such, I emphasized the need for public policies based on the Commandments of God and the Natural Law, which binds all men, for all time and in all circumstances. My experience having lived under Fidel Castro’s murderous Communist dictatorship, which included witnessing the enslavement of the Cuban people, of every color and creed, left me with a very clear understanding of my place in this world—and that my rights as a human being were guaranteed by God—not by any government or political order. “From its earliest days, the Cuban Revolution has also been a source of inspiration to all freedom-loving people. We admire the sacrifices of the Cuban people in maintaining their independence and sovereignty in the face of the vicious imperialist-orchestrated campaign to destroy the impressive gain made in the Cuban Revolution….Long live the Cuban Revolution. Long live comrade Fidel Castro.”—Nelson Mandela, July 26, 1991, Cuba. “Nelson Mandela will live in history as an inspiration for defenders of liberty around the globe. He stood firm for decades on the principle that until all South Africans enjoyed equal liberties he would not leave prison himself, declaring in his autobiography, ‘Freedom is indivisible; the chains on any one of my people were the chains on all of them, the chains on all of my people were the chains on me.’ Because of his epic fight against injustice, an entire nation is now free. 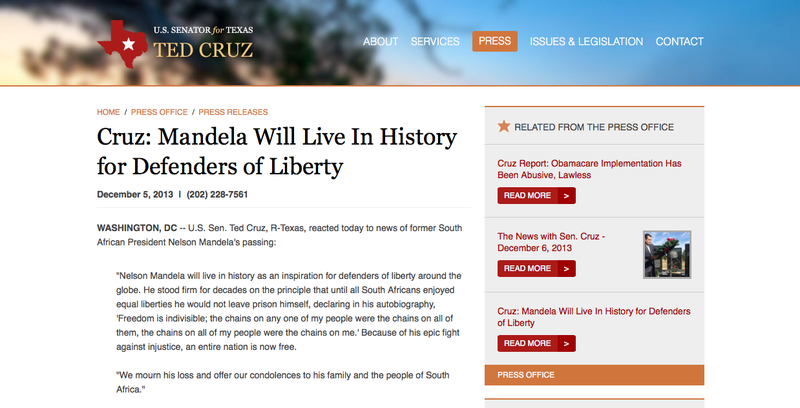 Ted Cruz has chosen to ignore Mandela’s admitted terrorist past as a Communist. Cruz has also chosen to ignore the fact that Mandela institutionalized unfettered abortion in South Africa– and that he single-handedly turned South Africa into a nation with some the most liberal laws on earth. Based on Cruz’ public statement of admiration for Mandela and his decision to participate in the Mandela memorial event, is it possible that Senator Ted Cruz still harbors admiration for his own father’s participation as a pro-Castro revolutionary activist? “’He was a guerilla, throwing Molotov cocktails and blowing up buildings,‘ Ted Cruz told the Austin American-Statesman [about his father] for a profile published in January 2006,” according to The Dallas Morning News (October 25, 2011). How else are we to explain Ted Cruz’ statement honoring Mandela– and his subsequent pilgrimage to South Africa to be at the memorial? This two-sided political approach is very common in the Cuban exiled community and among those of Cuban descent, who often view their parents’ former socialist pro-Castro activism with starry-eyed idealism, while they also denounce Castro. This inconsistent political behavior is precisely what has divided the Cuban exiled community for more than 50 years. As I said above, Ted Cruz’ participation in Nelson Mandela’s memorial and his written statement did not take me by surprise. Ted Cruz wants to have it both ways, but principled conservatives do not behave this way. In what appears to be an obvious attempt to defuse the criticisms he received, Ted Cruz “walked out” when Raúl Castro was delivering his speech at the Mandela memorial. Too little, too late. Another admirer of Nelson Mandela is U.S. Senator Marco Rubio, also of Cuban descent. Marco Rubio’s ambiguous account of his family’s return to Cuba after Castro’s takeover in January 1959, continues to raise questions and eyebrows– considering that the executions of hundreds of innocent Cubans began immediately in 1959, in the fortress of La Cabaña. In addition, it was well known that hundreds of innocent farmers and civilians had been executed throughout the island by Castro and his band of Marxist thugs during their terrorist “revolution.” By 1960 all American businesses in Cuba had been nationalized without compensation– and the United States had broken off diplomatic relations with Havana. Given these conditions, why did Marco Rubio’s parents leave the United States and return to Cuba to live under Castro? “The world has lost one of history’s most important figures, though Nelson Mandela’s example will live on for generations to come. Men and women striving for justice and fairness around the world have drawn inspiration from Nelson Mandela, and he showed South Africans and the entire world what the power of forgiveness truly means and can accomplish. My wife Jeanette and I send our condolences to the Mandela family and to the people of South Africa.” – U.S. Senator Marco Rubio (Republican-Florida) December 5, 2013. Nelson Mandela was not a political prisoner. He was imprisoned for espousing violent activities through the Umkhonto we Sizwe (abbreviated MK)– a terrorist organization which he co-founded, as the “armed” wing of the African National Congress (ANC). During his trial Nelson Mandela pleaded guilty to 156 acts of public violence, which included organizing terrorist bombing campaigns. Scores of innocent people, both black and white, were killed by Nelson Mandela’s Umkhonto we Sizwe terrorists, including women and children. In any other country Nelson Mandela would have been sentenced to death, or would have spent life in prison. Yet, he enjoyed communication privileges unheard of, for a prisoner with such a criminal record. As such, even Amnesty International, which is well known for its progressive side, would not take on Mandela’s case, since he was not a political prisoner (“prisoner of conscience”). In addition, pursuant to Amnesty International’s criterion, a “prisoner of conscience” must not have used nor advocated violence. By the time Mandela came out of prison and became President of South Africa he had given up on the idea of full-blown communism, given that he would not receive aid from the Soviet Union, which had recently collapsed. Cuba’s communism, which Mandela so admired, was his scariest example of a communist country starving after its long dependence on the Soviet Union. However, the communists from the former Communist bloc resurfaced through Sustainable Development (Agenda 21)– which is the United Nations socialist global initiative. The operatives of Agenda 21 have worked tirelessly in Africa to advance socialism– in ways that the Soviet Union could not achieve. Socialist politicians all over the world, including Mandela, have advanced their causes with the help of Sustainable Development, much more than they ever could with the help of the Soviets. While Nelson Mandela praised Fidel Castro’s Communist dictatorship, the Strait of Florida had already become a cemetery for untold hundreds of thousands of Cubans who had drowned trying to escape. This does not include the untold number executed by Castro’s government forces. After nearly 55 years of Castro’s Communist dictatorship, the human loss has become one of the worst catastrophes recorded in modern history. But New World Order religious leaders, politicians and monarchs do not feel it is in their best interest to demand that the Communist dagger be removed from the heart of the Cuban people. Instead, they vacation in the island prison. While the international community joined forces to bring down apartheid in South Africa– it is not willing to do the same, in order to help bring to an end the oppression of the people of Cuba. In fact, the international community has more than made up for Cuba’s economic loss after the Soviets fell, through trade with Castro. In addition, tourists and visitors from all over the world, including those from the United States, flock to Cuba with their dollars– while they mock the U.S. Embargo; consequently, they continue to support the island’s oppressive Communist regime. The hubris and hypocrisy of those who support the Cuban tourism industry are astonishing and immensely painful for those who continue to be persecuted, imprisoned and tortured in Cuba– as well as for those of us who have suffered under Castro’s Communist regime. It is extremely difficult for someone like me, as a survivor of communism, to witness this international massive socialist takeover– and its accompanying disregard for the most basic human rights. Members of my family, including my father, were political prisoners under Castro’s bloody regime. One of my uncles became one of the longest held political prisoners in the Western Hemisphere. Other family members were tortured and executed– or died fighting against Castro’s Communist forces. I visited Castro’s political prisons during my childhood in Cuba, so I have full authority to speak about the communist atrocities that I witnessed. “At his arrest in August 1962, Nelson Mandela was not only a member of the then underground South African Communist Party, but was also a member of our Party’s Central Committee. To us as South African communists, Cde [Comrade] Mandela shall forever symbolise (sic) the monumental contribution of the SACP in our liberation struggle. The contribution of communists in the struggle to achieve the South African freedom has very few parallels in the history of our country. After his release from prison in 1990, Cde Madiba became a great and close friend of the communists till his last days.” *- The Nelson Mandela Foundation explains that Madiba is the name of the Thembu clan to which Nelson Mandela belonged. The clan gets its name from a 19th century chief. All the members of this clan can be called Madiba. Some of the most scathing criticisms of Mandela have emerged from none other than the Communist ranks. This article, which appeared on December 7 on The World Socialist Website of the International Committee of the Fourth International (ICFI) is urgently calling for your attention. “South Africa today ranks as the most socially unequal country on the face of the planet. The gap between wealth and poverty and the number of poor South Africans are both greater than they were when Mandela walked out of prison in 1990. Fully 60 percent of the country’s income goes to the top 10 percent, while the bottom 50 percent lives below the poverty line, collectively receiving less than 8 percent of total earnings. At least 20 million are jobless, including over half of the younger workers. Meanwhile, under the mantle of programs like “Black Economic Empowerment,” a thin layer of black ex-ANC leaders, trade union officials and small businessmen has become very rich from incorporation onto boards of directors, acquisitions of stock, and contracts with the government. It is under these conditions that ANC governments that have followed Mandela’s, first under Thabo Mbeki and now Jacob Zuma, have come to be seen as the corrupt representatives of a wealthy ruling establishment. “Under its own majority rule, the lot of the ever-growing black population—today forming over three-quarters of the national total—has been notably poor. Misguided governance, low-quality education, skills shortages and massive unemployment levels of around 40% have left it more disadvantaged today than when Nelson Mandela was still behind bars. Black income has virtually flat-lined, betraying tremendous gulfs between the wealth of the different racial groups. Sadly, the nation Mandela leaves behind today remains one of the least equal in the world.” The Economist’s “The longer walk to equality” – December 6, 2013. The citizens of South Africa are being used, manipulated and abused by the socialists in the United Nations and its fellow traveling religious leaders, politicians and monarchs. Therefore, it is urgent that South African citizens insist on public policies based on the Commandments of God and the Natural Law, or they will find themselves in a worse situation 100 years from now. By then the depopulation activists at the United Nations will have entirely succeeded in convincing the black population that their economic problems lie in their numbers. The biggest enemy of the black South African population is the assault carried out by materialistic atheists on their communities. Meanwhile, millions of black African babies will continue to be aborted as part of “sustainability” programs, that teach economic and environmental stewardship through population control. It should be of no surprise that Mandela legalized abortion on demand in South Africa, even for minor girls. “South Africa’s new abortion law passed its final legislative hurdle today, clearing the way for President Nelson Mandela to replace one of the world’s toughest abortion laws with one of the most liberal. Under the new law, women and girls will be entitled to a state-financed abortion on demand during the first 12 weeks of pregnancy if they have no private medical insurance, and, subject to widely defined conditions, for a further eight weeks.” – New York Times, November 6, 1996. So while Nelson Mandela was calling for equality for all, he was making it legal for South African babies to be exterminated through abortion on demand. As expected, Barack Obama, the most extreme pro-abortion president that the United States has ever had, was in Johannesburg shaking hands with Raúl Castro and other communists. Raúl Castro blindfolding a rebel about to be executed by firing squad, for disobeying orders. CLICK TO ENLARGE. What is most disturbing is to see religious leaders like Francis issuing statements glorifying Mandela, as well as Catholic monarchs, like Grand Duke Henri of Luxembourg who attended the Mandela memorial (Grand Duke Henri is a passionate promoter of the United Nations’ Socialist initiative, Sustainable Development / Agenda 21) while ignoring the suffering of the people of South Africa, specifically the black population—which is relentlessly victimized by abortionists. It appears that this New World Order of religious leaders, politicians and monarchs does not seem to care about the Commandments of God or the Natural Law. Instead, these individuals have become puppets of the socialist collective—acting as emissaries through the Vatican, NGO’s and foundations, in order to advance the New World Order, under the watchful eye of the United Nations. Should these religious leaders, politicians and monarchs step out of line, the powerful machinery behind the United Nations will see to it that they are removed from power. The presence of these leaders in Johannesburg has everything to do with a show of force, to assert their New World Order of power, greed and control—and absolutely nothing to do with the well-being of the black population. The citizens of South Africa deserve better. [*]: Sustainable Development (Agenda 21) is the United Nations socialist initiative for global governance—which aims to dictate every aspect of our lives, with depopulation as its starting point— followed by restrictions on what foods can be consumed and infringement of private property rights, natural resources and sovereign rights. All under the disguise of environmental stewardship. Barack Obama, Communism, Cuba, Fidel Castro, Francis, Grand Duke Henri of Luxembourg, Marielena Montesino de Stuart, Marielena Speaks, Marielena Stuart, Nelson Mandela, New World Order, U.S. Senator Ted Cruz, U.S. Senator Marco Rubio, Cuba, South Africa. TEA WITH MARIELENA: Benedict XVI and Francis… together again!